For quantitative determination of aspartate and evaluation of drug effects on aspartate metabolism. • Sensitive and accurate. Linear detection range: 2 to 400 μM aspartate for colorimetric assays and 1 to 50 μM for fluorimetric assays. ASPARTATE , a nonessential amino acid, is a precursor to several other amino acids and is an excitatory neurotransmitter. 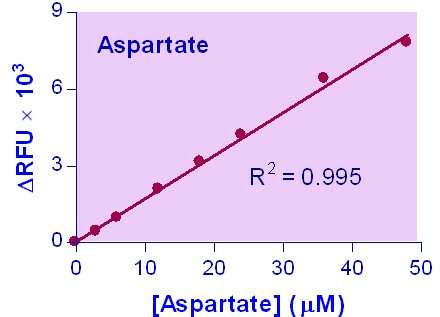 Aspartate is involved in the urea cycle and gluconeogenesis. 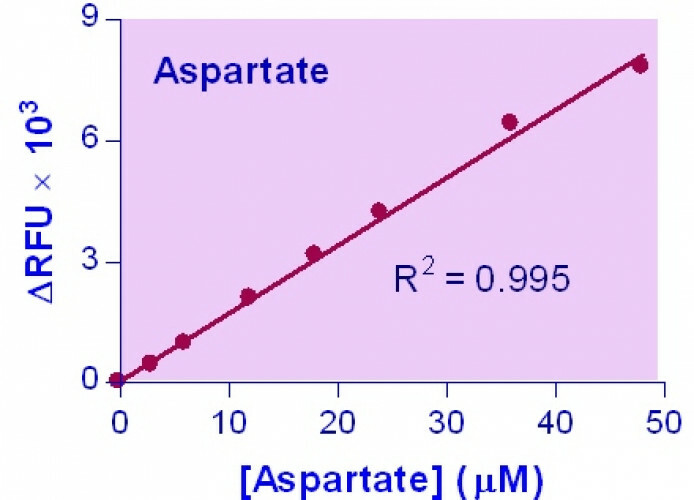 BioAssay Systems’ Aspartate Assay Kit provides a simple, direct and automation-ready procedure for measuring aspartate concentration. Aspartate is converted into pyruvate which is then oxidized with the conversion of the dye into a colored and fluorescent form. The color intensity of the oxidized dye at 570 nm or fluorescence intensity at λex/em = 530/585 nm is directly proportional to the aspartate concentration in the sample. Applications For quantitative determination of aspartate and evaluation of drug effects on aspartate metabolism.